As the title suggests, blog post number 6 is all about stump grinding! young tree climber, and after plodding round the old SED show at Milton Keynes, looking at machines and grabbing brochures (this being the pre-google everything you’d ever want era) a shiny yellow carlton 900, with the big 13hp honda engine and finger teeth was ordered. 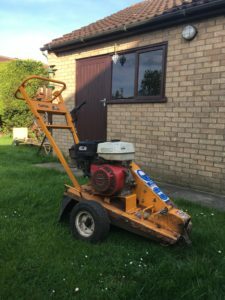 It might not have had 500 horses and a cab but it was mine and that little grinder taught me more about stump grinding than any big machine ever would, and the best bit was hardly anybody else had one! Fast foward a few years and I’m still stump grinding. A change of business model and company name, means no more tree climbing but stumps are still good. Now I run more than just the little Carlton, although she’s still in the shed and ready to go, with the bigger remote controlled machines offering higher productivity for less wear and tear on the body. Although I still use the techniques learnt with the little machine to help the job go smoother, without beating machines up and providing the customer with that little bit of a better service than some of our competitors. How do we do that then? Well, having more than one machine that we own means we can pick the machine to suit the job site. We’re not churning the ground up slewing a track machine round when the wheeled machine would be more suitable, or struggling to grind big stumps with a pedestrian machine, or even having to make customers wait while we try and get enough jobs to make the hire of machine viable. Then there’s the finish we leave. The material is worked into the soil with sharp teeth and stumps are almost always ground right out. That’s why you don’t see a huge pile of pure woodchip on our jobs. There’s always going to be some, but most of it is chewed up small and incorporated back into the hole, adding natural organic matter to create a better growing medium. 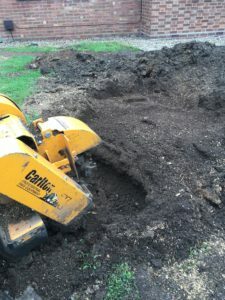 There’s a lot more to the job than just buying a machine and setting off, which we’ll cover in another post, but for now if you want any more information then if you follow this link it’ll take you to our stump grinding page. There’s some more images of jobs on our Facebook page. Or if you’d like to book us for some work just follow this link to our contacts page. ← Weird Looking things you see if only you look.